May is Mental Health Month and a good time to revisit some of the common myths about smoking and behavioral health. Unfortunately, there are still misconceptions that smokers with behavioral health conditions are not interested in smoking cessation and lack the ability to quit. 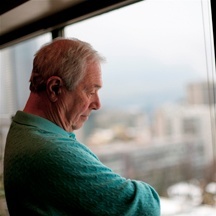 There are also concerns that these smokers will experience increased psychiatric symptoms when they quit.3 As a result, providers may not include smoking cessation in their treatment plans. Instead, they focus primarily on behavioral health symptom management. The reality is that people with mental illness and substance use disorders want to quit smoking and can quit successfully. Health care professionals can play an essential role in this process. Providers can bolster a broad health and wellness philosophy for patients by seeing tobacco cessation as a key component of behavioral health treatment and recovery. Here are some common myths and facts about smokers with behavioral health conditions. Myth #1: Persons with mental illness and substance use disorders don’t want to quit. Fact: The majority of persons with mental illness and substance use disorders want to quit smoking and want information on cessation services and resources. Myth #2: Persons with mental illness and substance use disorders can’t quit smoking. 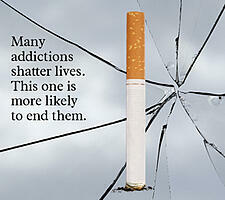 Fact: Persons with mental illness and substance use disorders can successfully quit using tobacco. Myth #3: Smoking cessation worsens psychiatric symptoms. Fact: Smoking cessation can improve psychiatric symptoms. Myth #4: Smoking cessation will threaten recovery for persons with substance use disorders. Increasingly, these myths about smoking and behavioral health are giving way to the facts. This is important for a clientele who will benefit greatly from an integrated treatment approach that includes smoking cessation as a priority focus. For more information about smoking and behavioral health, please visit our website or explore our free CE Courses on a variety of smoking and behavioral health issues. 1 Colton, C. W. & Manderscheid, R. W. (2006). Congruencies in increased mortality rates, years of potential life lost, and causes of death among public mental health clients in eight states. Preventing Chronic Disease, 3(2). 2 Walker, E. R., McGee, R. E., & Druss, B. G. (2015). Mortality in mental disorders and global disease burden implications: a systematic review and meta-analysis. JAMA psychiatry, 72(4), 334-341. 3 Prochaska, J. J. (2010). Failure to treat tobacco use in mental health and addiction treatment settings: A form of harm reduction? Drug and Alcohol Dependence, 110(3), 177- 182. 7 Anthenelli, R. M., Benowitz, N. L., West, R., St Aubin, L., McRae, T., Lawrence, D., ... & Evins, A. E. (2016). Neuropsychiatric safety and efficacy of varenicline, bupropion, and nicotine patch in smokers with and without psychiatric disorders (EAGLES): a double-blind, randomised, placebo-controlled clinical trial. The Lancet, 387(10037), 2507-2520. People with mental illness and substance use disorders want to quit smoking and can quit successfully. And mental health professionals can help. Until a few years ago, it was not common for people with mental illness or substance use disorders to be treated for their tobacco dependence. People with behavioral health conditions have only recently been identified by tobacco control and cessation professionals as a priority, even though their smoking rates are 2-4 times higher than in the general population (Lasser et al., 2000). The 2006 Morbidity and Mortality in People with Serious Mental Illness report issued by the National Association of State Mental Health Program Directors, found that persons with serious mental illness die, on average, 25 years earlier and suffer increased medical co-morbidity. They often die from tobacco related diseases and are more likely to die from these diseases than from alcohol use. The need to help this clientele quit tobacco is clear. Some strongly held myths have stood in the way of progress in this area. Fortunately, a growing body of research is debunking these myths, making way for new interventions. The California Smokers’ Helpline has developed the following free resources to help you learn more about smokers with mental illness and substance use disorders and how to help them. Fact Sheet: Tobacco Cessation for Smokers with Mental Illness or Substance Use Disorders. Online CE Training: Tobacco Cessation and Behavioral Health. Continuing education credits available to physicians, nurses, physician assistants, MFTs, LCSWs, and NAADAC certified counselors. People with mental illness and substance use disorders want to quit smoking and can quit successfully. And mental health professionals can help. Until a few years ago, it was uncommon for people with mental illness or substance use disorders to be treated for their tobacco dependence, even though their smoking rates are 2-4 times higher than in the general population. Myth #1: Persons with mental illness and substance use disorders do not want to quit smoking. Research argues that the majority of persons with mental illness and substance use disorders want to quit smoking and want information on cessation services and resources. Among hospitalized psychiatric patients who smoke, one study found that 79% were not only interested in quitting, but agreed to participate in a clinical study to help them quit (Prochaska, Hall, & Hall, 2009). Myth #2: Persons mental illness and substance use disorders are unable to quit smoking. In fact, a review of 24 studies, the recorded quit rates of patients with mental illness or addictive disorders were similar to those of the general population. Myth #3: Smoking cessation worsens psychiatric symptoms. On the contrary, smoking cessation can actually improve psychiatric symptoms. This myth has historical ties to the tobacco industry which has directly funded, or monitored, research supporting the idea that individuals with schizophrenia were less susceptible to the harms of tobacco and that they needed tobacco as self-medication. One randomized trial found that actively depressed smokers who quit reported a significant decline in depression symptoms and a reduction in alcohol use compared with participants who continued smoking (Prochaska et al., 2008). Myth #4: Smoking cessation can threatens recovery for persons with substance abuse issues. Smoking cessation can actually enhance long-term recovery for persons with substance use disorders. A systematic review of 17 studies found that concurrent tobacco cessation treatment with individuals in addictions treatment was associated with 25% increased abstinence from alcohol and illicit drugs six months or longer after treatment (Prochaska, Delucchi, & Hall, 2004). 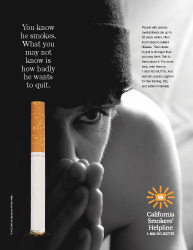 Clinicians are encouraged to talk with their patients and offer them assistance in quitting. Many of the treatment strategies that work for smokers without behavioral health issues (e.g., cessation pharmacotherapy and behavioral counseling) can work for this clientele as well.